Part the First: In where we meet our hero, Gen Shishio. We learn why Gen Shishio’s uncle drinks so much and why moving away did not solve the dilemma of the family business. My name is Gen Shishio and today is my birthday. By the end of the day, I will also be murdered. But let’s not get ahead of ourselves. The day started off like any other day. I was out the door of the restaurant at three in the morning. It was a windy morning and I could hear the wind louvers whirling, directing their energy into the storage facilities deep within Hub City. When I first came here, I was six or seven and everything seemed so amazing. Hub City was so strange looking, with its curved buildings and walls, exotic shapes and strange sounds. The city was designed to capture energy from every source possible, wind, solar, water, thermal, pressure and even sounds. I didn’t know that then, I thought the wind louvers were so loud and I just hated that sound. Its constant hum set my teeth on edge. I would learn when I was old enough to start working, the louvers were much louder than they appeared, without the designer plastics used to absorb, redirect and baffle their noises, they would be far louder. The louvers were above the quadrant wall that comprised our section of the ring of the city. They would provide reduced power levels until the sun came up and the solar arrays kicked in. This section of the city wouldn’t really come alive until our secondary power sources came online. The only things you could see were the glowpaint used to light the streets, casting a pale turquoise light, just enough to see by, if you knew your way around. Tourists could request a VR agent to direct them to where they wanted to go. I hadn’t used one in years. I could find my way though the city by smell alone. We lived in what is officially the sixteenth district, but called the Undercity by the locals. It got such a colorful name because it was one of the entry points to the lower city where most of the inhabitants of Hub City lived, protected from the environment. There were plenty of people who lived on the surface, but most of us were workers who ran stores, training facilities, or mini-factories providing services for farmers, industrials or artists who preferred to work above ground. I walked out onto the boulevard and could see yesterday’s festival art on the walls glowing gently. I remembered all of the artists who were teaching their particular art style and the walls were filled with impressionistic, rationalist, photorealistic and abstract art forms. Some were positively brilliant, others were simply adequate, all showed clear technique and a few were showing signs of true genius. I stopped to look at a particular piece and touched the wall and the painting. “Art request, name and history of this artist, please display last six pieces.” I spoke into my sub-dermal microphone. The city’s network interpreted my response from my sub-vocalization. It stored all of the local paintings and cleared the wall. It then displayed high resolution versions of the artist’s work. “Barad Thurston, age 25, current occupation: aspiring artist with 24 art credits and four successful art rotations. Secondary occupations include mechanical replacement tech, sewage power systems. His work has won several commendations and he is expected to take a supervisors role in the Artists Guild, in the coming year when Art and Functions Administrator Galen enters semi-retirement.” The autonomous computer system’s voice was a smooth and well modulated baritone. It’s name was Walker, after the programmer who created the Intelligence systems used in the Hub Cities. I turned off the autopilot and electrical configuration and set the bike for manual mode. I enjoy exerting myself and the cool morning air feels good. I make good time to the fishery. It is in the first and second levels of the Undercity near the river. It takes about thirty minutes of heavy activity to get there and back. The trip back is more difficult since its uphill and I’m laden with fish but I refuse to use the electric motor until the very last incline back to the surface. My uncle is standing at the door when I pull up. I expected it since I was a bit behind schedule. “Good morning, uncle.” He didn’t seem particularly unhappy, but lately he had been a bit harder to read than usual. “They better for all our sakes.” He dashes off to the kitchen and the night crew starts turning on the lights and prepping for the morning rush. I can tell today is going to be big. Each shift in this part of the city is six hours long. No one works more than six hours in any day, no matter what their job. So we get a rush of customers at the end of shifts and right before shifts start. To keep restaurants and stores from being overrun, most organizations stagger their shifts so businesses are not overwhelmed. This usually means we have a three hour window where there is a wave of customers, nonstop, then a slowing period where we clean up and restock the kitchen. We also get a tiny window between shifts where the leaving crew eats and passes along any issues to the arriving crew. It sounds confusing but once you learn the rhythm, it becomes like your heartbeat. You know when people are coming, you know how long the wave will last and after a time, you will know who everyone is until the end of the quarter when people are rotated to their next assignments or you get rotated to yours. I am a chef, like my father and uncle before me. I had always planned to be a chef, but when we left Japan and then later New York, things were not so certain for me to take up my father’s career. Hubs were not like regular cities, they did things very differently. People did not get or keep a job or get to establish a career until they had been working for a minimum of four years. I worked as a fish farmer, florist and medicinal grower, a sewage worker and a power-plant technician. My rotation was all assigned to areas close to my home and Walker assigned them to ease transitions and to ensure I would work with people who were compatible but intellectually challenging. I started working with my father at six, but once I came to the Hub with my uncle, I went to work at fourteen and did my rotations during the day shifts and worked partials with my Uncle at night. As a child, I was educated during a second shift and slept during the third. My life in Hub City was constantly filled with work, school or some other occupational study. My father died when I was twelve. We were very close and the circumstances of his death were not made clear to me. They said I was too young to understand but my uncle assured me all would be made clear when I was older. He told me to be patient. So I was. My uncle took me in and life continued on. Uncle arrived some time before four. He looked terrible. He had been drinking again and the habit only seemed to be getting worse, the closer I came to my eighteenth birthday. I didn’t know what he was thinking though I had tried several times to get him to talk to me. He was only surly and resentful and became even more resistant to conversation. He came into the restaurant, spoke to no one, walked around in the back, checked the menus and samples of what was being prepared. He snatched a bit off food from each setting and seemingly satisfied went upstairs to look down from the upper balcony. He took a small flash of saki with him out of the kitchen and as he climbed the stairs, he stopped to look at me before continuing to go upstairs. We were just closing and setting up for the Art Exhibit. We had several film screens able to be lowered down and configured to receive artistic information. Barad Thurston agreed to come by this evening to entertain guests and planned to do a series of paintings and instruction during the evening. While advertising was forbidden, open houses which gave access, instruction and opportunities to sample our wares was perfectly acceptable and within the City’s guidelines. While the guests were filing in, Uncle disappeared into the kitchen and was likely preparing something unique, a Yūgure signature dish or something only he could prepare. Everything was perfect, Thurston was flirting with Mei Ling, and she maintained an air of professionalism as she showed off his artwork, and worked with him to organize his showing. The restaurant was bursting with new faces and several of the local children were already showing up for sweets with their parents in tow. I didn’t notice when they came in. It seemed they just appeared at a table upstairs. It was possible they walked in while I wasn’t looking but Uncle seemed to expect them and had food being directed to the second floor. There were seven men in dark suits, three older, four younger. The older men were sitting down and facing the floor and the art below. Their four younger men stood behind them, perfectly motionless until they were needed to serve their masters. I recognize the chrysanthemum as a fish dish where slivers of fish are placed around in a layered circular configuration like the flower it is named after. The dish was beautifully garnished with green sprigs of parsley. In the center of the flower was a bowl filled with an unknown pâté. As I carried the platter upstairs, I could feel the presence of the men, an ominous thing. The hair on the back of my neck stood up and the urge to turn and run only intensified as I walked into the room. I could feel the eyes of the standing men looking me over, staring at me as if I were a fine delicacy about to be served. The upper serving room has variable lighting allowing us to create an atmosphere suitable for any occasion. I knew the lights were on, but shadows felt as if they were whipping around the room masking whatever I tried to bring my gaze to. No matter who I looked at, I could not see their faces. “He is, indeed,” said the one on the right whose long eyebrows were bushy and white. His hair also hung long and unkempt, a wild ragged appearance. One of his eyes, the right one had a milky look, perhaps an untreated cataract. The one on the left, said nothing, but was the first to reach for the plate as I placed it on the table. “Sit with us, Gen Shishio,” he said suddenly, as placed the tray in the center of the table with a variety of foods around it, as yet untouched. He startled me, his voice while a whisper, left me with the feeling of nails on a chalkboard. I felt unable to resist. I sat. Fukui, the Silent, had begun taking food and placing it on his plate. He made a great effort to sample everything and his plate was an artform as he arranged his food. I could almost see a pattern before I was distracted by a presence behind me. It was my Uncle. “Murata, you have not informed your nephew of our arrangement?” Niigata, of the Hot Eyes gazed up at my uncle who returned a stare equally intense. “No, I had hoped you would find another and leave our family alone. You have caused us enough harm.” His voice was hard, each word biting and fell from his mouth like ash. “Talents like the one’s in your family are exceedingly rare, Murata. Not just anyone can prepare food for our kind.” Ishikawa, sitting between his brothers points to another chair and uncle joined us. The four men who had taken up a position in the four corners of the room, appeared suddenly next to my Uncle and I and prepared plates for us, creating a beautiful setting of eel, shrimp, sushi and the mystery fish, with some of the pâté placed as a garnish on the fish. “Eat, business can wait while we enjoy the company of new friends.” Ishikawa statement of friendship felt almost sincere. I almost believed it. Below the table my uncle kicked my leg as he picked up chopsticks and began to eat, first the fish soup, then around his plate, avoiding the mystery fish completely. Our conversation lingered around the artist and his work, our impressions of the city, and how we enjoyed our lives here. They were marvelous to talk with, each seemingly knowledgeable about a variety of subjects. I had almost forgotten my initial impression of them. Until it was time to eat the fish. I also remembered what fugu was also known for. It was also known for its deadly neurotoxin produced by special glands inside the fish. The fish could only be prepared by a chef of renown skill because even the tiniest mistake could equal death. A slow suffocating death as the body loses control of its autonomic functions and breathing ceases. “Eat the fish, Gen Shishio. You trust your uncle, don’t you?” Niigata turned his gaze toward me and his eyes under those terrible eyebrows began to glow. “Of course.” I ate the first piece of fugu without fear. My uncle and father were known for their skills in the kitchen. Dead drunk, my uncle was a better chef than most were sober. I have to admit the flesh was heavenly, even more so knowing every bite might be my last. 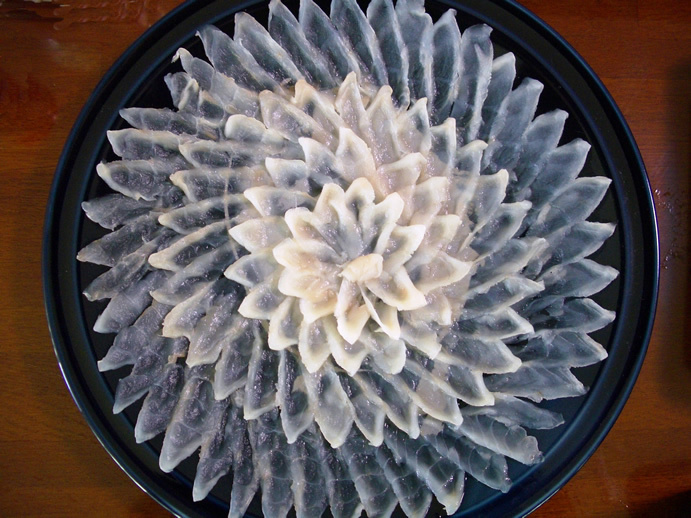 I trust my uncle but remember how so many people have managed to die eating fugu, even expertly prepared. I consumed the second and the third. “No, Gen. Don’t eat that.” My uncle whispered, his head hanging down. As one, they looked up from their plates, placing their chopsticks on the table, “We insist, Gen Shishio.” Their full menace returned. Their dark suits became darker as shadows spread from them and the room seemed to darken as well, as if it were cut off from the rest of the light in the restaurant. I picked up my chopsticks again and moved toward the pâté. “Are you willing to take his place, Murata? You aren’t even sure you could survive transition are you? That is why we waited until he turned eighteen. You were too old for our needs. Have you changed your mind?” Ishikawa’s smooth voice taunted my uncle and each word seemed an acid to him. “I would never let anything happen to you Uncle. Not now. Not ever.” With that, I ate the ball of poisonous pâté. I didn’t have to wait long. The room grew darker and colder. My uncle got up and cleared the table as they lay me upon it. I saw the room moving away, I floated above my body and looked around. I could see Ishikawa, Fukui, and Niigata but they were not what they appeared to be. Ishikawa appeared as a man made of shadow, whose essence was connected to every shadow everywhere. Fukui, looked to be made of rock, rough hewn with hunks missing from him. His voice was the scraping of rocks together. Niigata, appeared to be made up of nothing but eyes. His eyebrows draped all the way to the floor and inside his shirt were other eyes that blinked and stared at me. Their four servants appeared as men but were nothing more than shadows in the shape of men, there was nothing to them physically. Despite their shadow substance, they were quite real enough to keep my Uncle held as he watched me die. A painting of flames swirling artistically moved from the wall and imprinted itself upon my skin, around my arms, around my chest and across my back. Then a scream from the main floor as Thurston fell to the ground, dead. Soon others followed and the screams penetrated my darkness and I could see my body again. I made my way toward it, first slowly, then faster, falling back toward it like water into a drain. I sat up, my breath rushing back into my body, my flesh cool to the touch. Hours had past. I was lying on the same table, my breath ragged and my chest and arms burned. My uncle sat up as my breathing resumed. “Am I dead, Uncle?” I felt cool, different, constrained like a shirt that somehow became too small while I was wearing it. Death magick at its most chilling…a great story to read for a rainy Sunday night, Thaddeus.